Art Preparation: Kwik-Ship Bumper Stickers require the submission of a digital file. Copy Changes: Copy changes are available at the combined quantity price plus $34.00 per each change. Item number and colors must remain the same on the entire order. Each change must be in multiples of 125. 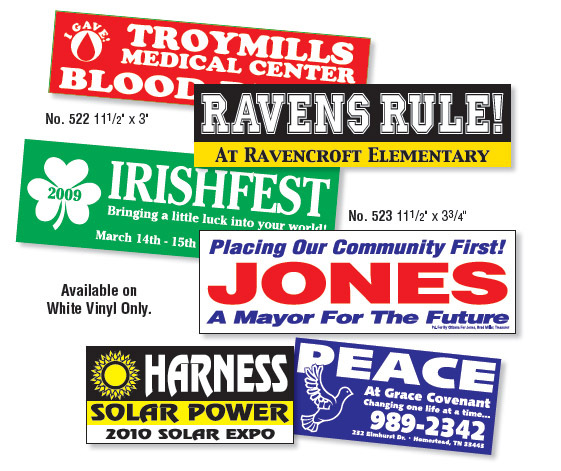 Stock Bumper Stickers are screen-printed on Removable White Vinyl. No. 581 is screen-printed on Chrome Polyester and die-cut as shown. Stock Mascots: Mascots can be added to items No. 578 and No. 580. See above for available stock mascots. Imprint Colors: Stock White Vinyl Bumper Stickers are available with the choice of any two of our standard colors. Copy Changes: Copy changes are available at the combined quantity price plus $34.00 per each change. Item and colors must be the same on the entire order. Each change must be in multiples of 125.